Halloween is the time of the year where you can be messy and let your hair down, wear weird costumes to look scary and eat lots of sugary foods and delicious candies. Almost everyone loves this spectacular event, but that one day of fun can also take a a real toll on your health as many of these “Halloween-inspired foods” have negative effects on the body. Following some simple fitness tips this Halloween will help you stay on track for the rest of the season. Although it’s hard to resist eating those delicious treats, there’s a healthy alternative to keep your Halloween healthy and fun. Having a healthy meal before going to the party or trick-or-treating will reduce your temptation to eat unhealthy snacks along the way. This will also keep the kids not to eat too much candy. Why not bring a healthy snack with you? You can bring a snack bar in case you will get hungry before the party starts. Weight management can be a major challenge during the holidays. Choosing the right portion of your calorie intake is also helpful. If you are attending a party or planning to host one, why not consider and choose healthy snack alternatives. Instead of filling your basket with sugar-rich candies, you can try dark chocolates or fruits instead. According to Men’s Fitness, Halloween candies can have an exercise equivalent. Dark chocolate is good for the skin as well as the fruits. 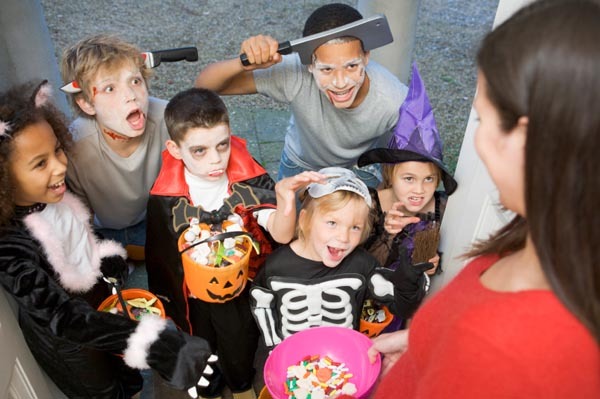 Non-food options like stickers or small toys and other non-candy items are a healthy way to keep your Halloween exciting and fun while you cut down your sugar intake. Halloween is not all about candies. It is a holiday full of fun activities. Stay active by decorating your house with spooky decorations or take a long walk around the neighborhood while you are trick or treating. There are many organizations which you can join that puts up activities like zombie run and other fun events. This will add a great experience on your holiday and at the same time limit the amount of your time spent on eating junk foods. Before eating those candies in the bag, try to read their labels first. Inspect it if your kids are allowed to eat them. Make sure that your child is with a group of children when going house to house and keep a watchful eye where they are headed next. At night, allow them to bring a flashlight or let them wear something, which glows in the dark to avoid accidents. Only go to houses where there are people outside or with the porch light on. Although this holiday season will be difficult to keep that fit body and have a healthy lifestyle, still there are things you can do to maintain that healthy body even when surrounded by huge feasts and delicious treats. When at home, for instance, cosmetic products like Body Applicator Wraps can help you maintain that healthy figure. Take this as a challenge and start planning of other strategies that you can do to achieve your goal.